I always felt slightly sad for the Scottish singer/songwriter, Donovan. And no, not because he was born in Maryhill, Glasgow but because he came onto the music scene right around the same time as one of my favourite musicians: Bob Dylan. 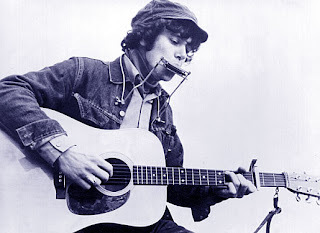 In the UK, Donovan was appreciated in his own right while in North America, he was known as the "British Bob Dylan" - which doesn't really lend Donovan any credit. Yes, both Dylan and Donovan were initially folky singer/songwriters and yes, both had anti-war protest songs. However, Donovan had a more jazz-influenced/pop-infused approach to music than Dylan. While Donovan wrote about the beauty of his sleeping girlfriend, Dylan was more prone to writing about how much he had grown to hate his wife. And that's a fundemental difference between the two. So, last month came news that Donovan (along with filmmaker, David Lynch?!) plans to open a "university" in either Edinburgh or Glasgow. The university will offer students enlightenment and "create invincibility in national consciousness". I love Donovan's music and think he is immensley talented, but I'm not too sure how this mumbo jumbo meditation stuff will go over with the punters of Glasgow. Edinburgh, maybe. Nevertheless, if it leads to less violent hash smokers, than I am all for it! (N.B. That song, Sunny Goodge Street, although about London, really reminds me of Glasgow whenever I hear it).